Hull and deck are intact, cedar strip hull with oak ribs, needs varnish and needs to be reassembled. Gator Trailor comes with boat as well as the 3/1/2 Hp Johnson shown. Most of the brightwork replated. 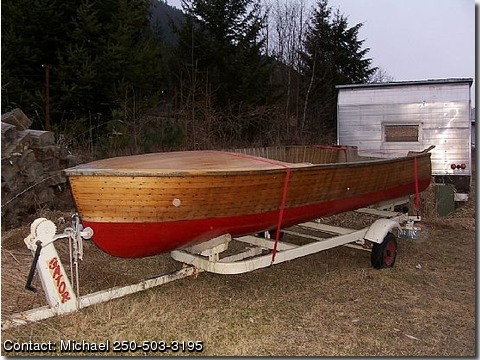 Boat is a rarity and has signature of boat builder on pieces. Producer of CBC-canada, was the original owner. Boat was at Gibsons Landing, home of the Beach Combers TV show for many years.